The Sharpshooter Mouse is a breed of mouse found in the Gnawnian Express Station. It can only be attracted and caught during the Raider River phase, where they are known to drop Copper Beads as loot. 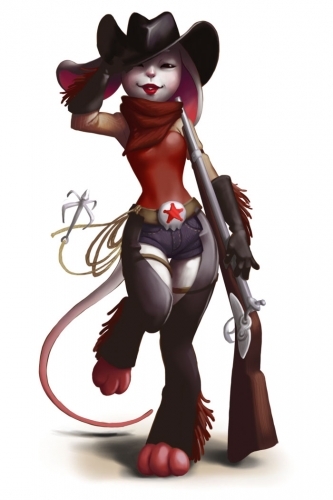 Winsome, striking, and full of personallity, the Sharpshooter Mouse has no problem in making her mark as most marks just sit and stare, captivated by her. But don't let her looks fool you: She is one mean mouse with ruthless precision and perfect aim. She can shoot the tail off a Tiny Mouse at a thousand yards without batting an eyelash or even aiming down the sights! Her signature move is a 360-degree twirl through the air, firing her shot as she comes about without looking through the scope. Catching this mouse will decrease the number of Raiders Left by one. Sharpshooter mice have no specific preference for any kind of cheese. Law type traps such as S.L.A.C. are very effective against the Sharpshooter Mouse. They are more attracted when the correct charm (Roof Rack, Door Guard, or Greasy Glob) for the current wave is armed, and do not visit during Trap Checks. The Sharpshooter Mouse drops the Gnawnian Express Egg and Sharpshooter Egg during the annual Spring Egg Hunt. This page was last edited on 27 May 2017, at 00:53.